"If you’re walking down the right path and you’re willing to keep walking, eventually you’ll make progress." These words from a US President, so simply, yet eloquently echo what has always been my life’s mantra. In government parlance, this basically means that good governance matched with a people’s collective will and determined effort, inevitably translates to progress. Good governance effects growth, which sets us well on our way to progress… towards a new Surigao. A year ago I took my oath as Provincial Governor and made my covenant to the Surigaonons to lead, to inspire, to work, to protect and preserve our province. Destiny gave me the opportunity to govern and introduce a new kind of leadership – a “hands-on” leadership that is committed to serve, to innovate and create a difference in the life of our constituents. I take this duty upon my shoulders without fear or reservation. At the start of my administration, the challenges have been great. Setting the fundamentals of good governance meant initiating changes. Change, though, always brings with it inconvenience, discomfort and even pain. Our hardworking Team Capitol can attest to this. But having faith in the Divine Providence and in the Surigaonon, I know there is nothing that we cannot hurdle and overcome. Before I give my report, allow me to express my gratitude to all of you, my fellow Surigaonons who have given your faith, cooperation and support in all the programs and projects of this administration. • Congressman Francisco T. Matugas and Congressman Guillermo Romarate, Jr.
• Most of all, the Almighty God. This administration started with a clear vision and development direction. We envisioned the Surigaonons to be God-centered, empowered, globally competitive and prosperous- living in a province with sustainably-managed resources, well-developed infrastructure system, continually inspired by ethical and responsive leadership. This administration takes upon itself the fulfillment of this vision as it works to achieve its mission of a transparent, participative and accountable local governance through effective and efficient delivery of services. However elusive and impossible it may seem, reducing poverty and ensuring the well-being of every Surigaonon are the most important goals of this administration. And, to effectively attain those goals, to be able to reduce poverty and uplift the living standards of our people, we needed to engage ourselves in concerted efforts towards promoting good governance and ensuring the sustainable growth of our province. We dream of a “Bag-ong Surigao.” However, we can only see its fulfillment if we dare to take action, and if we dare to continue the journey we have started on the road to healing and progress. Today, after a year of making this journey together, allow me to show to you what the Surigaonon has in store for him now, with the hard work and dedication that this administration has committed and devoted itself to do during the first year. My report is anchored on three (3) major areas, namely: 1) effective and efficient administration; 2) good governance and, 3) delivery of services through the HEALS Agenda. On achieving effective and efficient administration, we have effected organizational restructuring and streamlined office operations, resulting in economic gains and work efficiency. We have provided a conducive working environment through a major face lifting of the Provincial Capitol and its component buildings like the Governor’s Mansion, Capitol Chapel and the Legacy Garden, which is to be known as the Provincial Eco- Park upon its completion. We have implemented employees’ welfare and development programs, most notable of which are the salary increases of our regular employees, the 1st Tranche of which took effect on July 2010. We have also given additional incentives to our Job Order, casual and regular employees in the form of groceries in the total amount of P 3,000,000.00. There will be another salary increase for the 2nd tranche effective this July 2011 under Supplemental Budget No. 1 series of 2011 which will provide salary increases ranging 10%-25% depending on the salary grade. The wages of casual employees and job order likewise increased daily rate from P166.00 to P200.00. Productivity Enhancement Incentives and grocery allowances were also given to Regular and casual employees last Christmas. We also sustained the provision of Salary Step Increment to all qualified officials and employees who exhibited satisfactory and above satisfactory performances. Monetization were also granted to some employees, based on need. We have enhanced the capability of our provincial workforce, through various trainings. Department heads underwent short courses in the Asian Institute of Management, Development Academy of the Philippines and the National College for Public Administration and Governance, among others. Long-term scholarship programs are also sponsored by the Australian Agency for International Development (AusAID) under the Philippines-Australia Human Resource Organizational Development Facility (PAHRODF). At present, we have three (3) scholars for post graduate courses in Australia. The Provincial Government launched the Capitol Summer Sports Fest last May 2011 under the leadership of Vice Governor Arturo Carlos Egay, Jr. This sports fest signified the importance of health and fitness as well as teamwork and camaraderie among employees. We implemented a spiritual renewal program starting with the Capitol Employees through the conduct of the weekly Monday Morning Sharing, recollections and the observance of First Friday Masses. We are now in the process of crafting the Moral Value Formation Framework for our guidance. Good governance is exemplified by predictable rules, transparency and accountability, efficiency and effectiveness. It entails participation and consensus. It encourages more productive investments leading to higher economic growth which, in turn, will lead to more jobs and income opportunities for the Surigaonons. The Provincial Government values and maintains good governance in the context of Transparency, Participation and Financial Accountability. The Governor’s Weekend Report is aired every Saturday over the local radio stations to recap the projects implemented and activities undertaken by the Governor within the week. The “Kapihan sa Kapitolyo”, a round-table forum between the media and the Provincial Governor, department heads and national line agencies, is held to discuss pressing issues and to craft immediate solutions thereof. Moreover, “Ang Bag-ong Surigao Magazine” was launched as an Official Publication of the Province of Surigao del Norte to serve as another venue for advocacy campaigns of the provincial government. The Official Website of the Provincial Government was established, which contains news updates and information on governance, tourism destinations, investment opportunities and municipal profiles among others. We joined the internet social networking stream through the Facebook Fan Page. We have installed the Closed Circuit Television or CCTV in key departments within the Provincial Capitol for transparency and improved efficiency. We complied with DILG Memorandum Circular No. 2010-83 which requires posting of various documents in the website of the DILG. To promote consensus-building and a participatory approach in governance, we conducted regular meetings with Municipal Mayors, together with the two district representatives of the province. Barangay visits in 330 barangays were conducted to provide a venue for community dialogues, diagnosing their issues and problems and providing quick response to pressing needs. Local Special Bodies were activated like the Provincial Local School Board; the Provincial Health Board; the Provincial Housing Board; the Provincial Tourism and Development Council; the Provincial Peace and Order Council; Provincial Disaster Risk Reduction and Management Council and the Provincial Development Council. Alliances and partnerships with the different national line agencies and the civil society groups were formed. • AusAID Provincial Road Management Facility (PRMF) - has provided P50 M worth of road projects as annual base funds for the rehabilitation of provincial roads and capability building activities to strengthen public administration. • Philippines-Australia Community Assistance Program (PACAP) – a bilateral development program supporting community-initiated, economically sustainable, ecologically sound and gender-responsive development programs. The program formally ended last September 2010 but the projects are replicated in other areas of the province. • Oxford Family (OXFAM) – has on-going projects on improving Disaster Risk Reduction Knowledge Management Systems in the Philippines for Safer Communities in 10 pilot barangays in the province. • United Nations Development Fund (UNDP) – has a current project on the integration of Disaster Risk Reduction and Climate Change Adaptation (DRR/CCA) in Comprehensive Land Use Plans covering Claver, Gigaquit, Bacuag and Surigao City as pilot areas. • World Bank Global Facility for Disaster Reduction and Recovery (WB-GFDRR) – has provided technical assistance in the integration of the DRR and CCA as part of the Comprehensive Development Plans of municipalities of Alegria, Mainit and Tubod in partnership with the Department of the Interior and Local Government. • Growth with Equity in Mindanao (GEM) Program – has implemented community infrastructure projects funded by United States Agency for International Development, covering construction of small scale infrastructure projects in conflict-ridden barangays. • The Mindanao Rural Development Program Adaptable Program Loan 2 (MRDP-APL 2) with three (3) components: Infrastructure, Livelihood and Natural Resource Management; and the Caraga Integrated Development Project (CIDP) will fund the different agricultural related programs. - giving awards and recognitions to municipalities with highest tax collection or remittance. At this point, may I recognize the top three performing municipalities in Real Property Tax Collection as of January-May, 2011 with the municipality Alegria with the highest collection, followed by San Isidro and Sison. Let me also acknowledge the top three municipalities in Real Property Tax Remittance of the Provincial Share to date. For basic Real Property Tax, on top of the list if the municipality of Claver, followed by Mainit and Placer. For Special Education Fund, the top performer is Taganaan, followed by San Isidro and Claver. • We have also relentlessly pursued outside funding sources/partners for our local initiatives. Financial management is not complete if we focus only on funds in-flow, rather, we also employed strategies and measures to ensure an efficient resource allocation and utilization so that maximum benefits are derived from our limited resources. We have diligently adhered to the 25% reserve on Maintenance and Other Operating Expenditure and Capital Outlay as safety nets for possible unrealized income estimates. We have reduced and controlled fuel consumption from P5M in July to December, 2010 to P854,000.00 in January to June, 2011. Pending the final result and recommendation of the Organizational Diagnosis, the province, as part of its austerity measures, has implemented a conservative approach in the filling in of vacant positions. We have strictly adhered to RA 9184 on Procurement of Goods and Services and patronized the DBM Procurement Services Depot. A counterparting scheme between and among Municipal and Barangay Local Government Units and the Provincial Government is implemented not only to generate more funding but also to empower the LGUs and capacitate them in project implementation. While IRA is still the primary source of income for the province, we have tried our best to lessen IRA dependency through improved tax collection and improved management of the economic enterprise. For CY 2010, the province’s income totaled to P 561,191,268.68 of which P281,696,905.37 became our realized income during the start of my term from July-December, 2010. This income was spent for the 1st tranche of salary increase in the total amount of P6M, the face-lifting of the Provincial Capitol which amounted to P27M, financial assistance to Municipalities and Barangays in the total amount of P19M, and gasoline in the amount of P5M, among other expenses. On the other hand, collection/income for the period January-June, 2011 amounts to P356,404,201.87 as compared to P279,494,363.31 for the period January to June, 2010. To provide the province with a road map to help us elevate from poverty and eventually achieve economic sustainability, we conducted the Provincial Economic Summit with Secretary Cayetano W. Paderanga, Jr. of the National Economic and Development Authority where the Sustainable Economic Development Framework Towards Poverty Reduction was formally presented prior to full implementation. Our development agenda is the HEALS program, implemented using the convergence approach. To provide wider access to health care services, especially to the poor and underprivileged in far-flung barangays, we have revived the commendable project widely known as Panambay sa Barangay. • 4,263 clients were served for laboratory services. We have also offered medical, dental, laboratory and other services at the Provincial Health Office Clinic serving a total of 14,111 clients as of date. A novel collaboration with the Surigao Center for Health Specialists was forged to address the shortage of medical doctors in the conduct of Panambay Sa Barangay. Thanks to Dr. Roy Ycong and Dr. Romina Rusillon and their team for sharing their time in our health community outreach programs. Under the Maternal and Child Health Program, the delivery of quality health services were likewise strengthened. Construction of Birthing Clinics and repair of Health Centers of Gigaquit, Malimono, Alegria, Socorro, San Isidro, General Luna, Burgos and Barangay Health Station of Jubgan, San Francisco funded by AECID – a Spanish grant, were implemented. To improve health service delivery in Siargao District Hospital, we resorted to hospital reorganization by downgrading Sta. Monica and Pilar into referral and birthing facilities. The medical officers from three hospitals were transferred to Siargao District Hospital and more personnel were assigned to address gaps in services. A Memorandum of Understanding was crafted defining the roles of medical officers reassigned to manage the referral hospitals. Meanwhile, we have also completed Phase I and II of the construction and improvement of the Siargao District Hospital with Health Secretary Enrique T. Ona leading the inauguration rites. We have already started construction of Phase III. Indigent outpatients enjoyed free consultation and PHILHEALTH benefits were expanded thru the PDAF of Cong. Francisco T. Matugas. Cong. Guillermo A. Romarate likewise expanded PHILHEALTH benefits for constituents in the mainland municipalities. Thanks to Dir. Rod Ariar for closely coordinating with the two congressmen in this project. Trainings of hospital personnel as well as provision of needed facilities were given top priority. The operationalization of the Area Health Zone through the signing of the Memorandum of Agreement to support the Inter-Local Health System is now in progress. This administration recognizes the need to revitalize the educational system to enhance our most valuable resource – the human capital. Thus, we held the Education Summit 2011, which saw the launching of the Education Roadmap towards Building a New Surigao through Quality Basic Education. The launching was attended by the Secretary of DepEd, Bro. Armin A. Luistro. This sets our direction for quality education for our children as well as a continuous drive for excellence of our teachers. This road map is responsive to the needs of our people and tailored to suit the achievement of the Millennium Development Goals. A Memorandum of Agreement for Project BEST (Barangay Education Strategic Team) was signed with the Resolutions of Support of different stakeholders. The goal of this project is to have a zero drop-out rate. The team is composed of the Barangay Captain, School Principal, members of the Barangay Council, PTA President, teachers, NGOs and GOs. We have implemented a 100% increase in the salary of school board teachers from P3,000 to P6,000 monthly plus a chalk allowance of P1,000. This is in recognition of the importance of teaching and the challenges our teachers face in their mission to make a difference in the lives of our children. We employed 30 teachers for Siargao Island and 56 teachers in the mainland in 2010. For this year, we provided 82 teaching slots with a total budget of P1,476,000.00 from January to March and 60 slots from June to December with a total budget of P2,520,00.00. We also provided an honorarium of P2,550,000.00 for K+12 teachers on a counterparting scheme with the LGUs. We opened 8 school annexes and 3 high school classes in Mainland and Siargao Island to accommodate the number of students in far flung barangays. Equity and access become the primary considerations. The “Eskolaran”, a college scholarship program with an annual allocated budget of P6M, continues to benefit our indigent and qualified high school graduates. The program has at present 300 scholars, producing 42 graduates last March, of whom 10 graduated with honors. We sought the assistance of the National Education Academy Program to conduct the capacity building program for some 300 elementary and secondary school principals to equip them with management and supervision skills. We believe that well-placed, effective and efficient school systems depend largely on the quality of school administrators. Moreover, the province successfully hosted the Caraga Regional Athletic Meet 2011 with Surigao City as co-host. Some 3,353 athletes from nine divisions competed in 17 different sports events. This big event had the Secretary of the Department of Budget and Management, Florencio Abad as our guest. We received words of praises for the wonderful hosting and full support to the entire activity. The Education Caravan was recently launched in municipalities and barangays situated along the highways. It was dubbed as the 2011 Health Education Caravan where Basic Health Kits were given to 4,000 out of the targeted 10,000 preschoolers and Grade 1 pupils. The other 6,000 will be distributed in the next few days. Personal hygiene and grooming were stressed during the caravan. Parents and community officials were very enthusiastic to share their time with us in making the event very meaningful. Recently, I signed a Memorandum of Understanding with DepEd Secretary, Bro. Armin Luistro, for the construction of school buildings thru local administration in the total amount of P53M for the province. These classrooms will be designed in such a way that it will also serve as evacuation areas during calamities, complete with kitchen and lavatory. These school buildings will be managed by the LGUs. Indeed, the sustainable development of our natural resource relates to poverty reduction. Hence it is imperative upon this administration to ensure the sustainable management of the environment and the optimal utilization of our resources. With this in mind, we have strengthened further our resolve to protect our environment. We have strictly required the Environmental Compliance Certificate prior to the issuance of Sand and Gravel and other Quarry Permits, and we consider this a huge leap towards protecting our land resources. We forged a Memorandum of Agreement on the Co-Management of Sand and Gravel and other Quarry Resources with nine (9) Local Government Units, namely, Claver, Gigaquit, Bacuag, Tubod, Mainit, Alegria, Sison, San Francisco and Malimono, to share both authority and responsibility in the management and utilization of these resources. This is a noteworthy innovation that made possible a more efficient monitoring mechanism while instilling among them a sense of ownership of their resources. The Kalimpyo, Kahapsay Surigao (KKS) was launched in support for the advocacy of the protection of the environment. This program has already trickled to the municipalities, through the active involvement of the municipal officials and the local communities who have manifested their support to our advocacy. Let me acknowledge the dynamism of both local and foreign resort operators in Siargao Island who comprise the Siargao Tourism Operators Association, under the leadership of Susan Brandstetter, who have initiated a laudable program on solid waste management dubbed as “Siargao Green,” a public private partnership on environmental management in the offing. Soon to be completed is the Provincial Eco-Park which will showcase our exhibits on environment, cultural heritage and tourism. This will create awareness and promote appreciation on eco-tourism among our people. Dialogues were also conducted with large scale mining companies to ensure implementation of environmental protection programs and relevant community projects under the Social Development Management Plan. The Disaster Risk Reduction Office was established to serve as the focal office in-charge of planning, trainings, advocacy and quick response in times of disasters and calamities, under the supervision of the Provincial Disaster Risk Reduction and Management Council. We have just been informed that our DRR office passed the Gawad Kalasag first round of evaluations. Our tourism industry is one of the largest and most promising industries in our province. Taking this into consideration, we have intensified our efforts to sustain our niche as among the country’s prime tourism destination. The Surigao’s Best and Tourist Information Center at the Provincial Sports Complex is established to support tourism and livelihood promotions. This center houses “Surigao’s Best” products generated from livelihood programs and promotes “Surigao’s Best” destinations for our local and foreign visitors. This is a joint project with the League of Municipal Mayors under the leadership of Mayor Sheila Mae O. Cebedo of Bacuag. On the other hand, significant tourism events like tourism investment, fairs, exhibits, festivals and others were participated, coordinated and supported. The 1st Siargao Surfing Festival 2010 and Siargao Surfing Festival Agri-Aqua Trade Fair at General Luna were successfully conducted We also supported the festivals of the different municipalities: Bakhaw Festival (Del Carmen), 1st Siargao Surfing Festival (General Luna), Sapao-Sapao Festival (Sta. Monica), Sani Festival (San Isidro), Tinabangay Festival (Socorro), Lubi-Lubi Festival (Bacuag), Gakit and Jinawa Festival (Gigaquit), Bolingit Festival, (Malimono), Kabibo Festival (Alegria), Panginabuhian Festival (Taganaan) and the Wara-wara Festival (Tubod). All these festivals have promoted not only the people’s culture and heritage, but also their local products and destinations. A P100,000.00 financial assistance were given to each municipality as our contribution in the conduct of their local festivals. With the Lubi-Lubi Festival of Bacuag as our official contingent, we also made a grand comeback in the prestigious Sinulog Festival in Cebu and won the accolades of many. We have also successfully conducted the annual sports events that has continuously lured tourists to our province, the 12th National Surfing Cup and 16th International Surfing Cup in General Luna and the 4th Siargao International Game Fishing Tournament in Pilar, with no less than Department of Tourism Secretary, Hon. Alberto Lim as our guest of honor. A Tourist Lounge was also established in one of the famous tourism destinations in Pilar, the Magpupungko Rock Formation. Amidst the emerging threats to food security, this administration has given importance to a sustained agricultural and fisheries productivity growth. We reopened the Provincial Agriculture Satellite Office in Cancohoy, Del Carmen and Barangay Ipil, Surigao City, to serve as training center and demo farm in Siargao Island. The visit of Secretary Proceso J. Alcala of the Department of Agriculture during the Farmers and Fishermen Provincial Forum signaled the full support of the department to our agricultural programs. We distributed 5,229 bags of subsidized palay seeds under the Rapid Seed Supply Financing Project (RASSFiP) Program of the Department of Agriculture and 204 bags of hybrid upland palay seeds. Several demonstration projects were established showcasing the different technologies to farmers which included the following technologies: Five (5) technology demonstrations were conducted for Rice-duck Farming System where production increased by 15.80%; reduced utilization of synthetic fertilizer by 77.4%; reduced the use of chemicals by 75%. Some thirty (30) units of composting facility were also distributed where 60 vermi heads were established. Seven (7) drip irrigation systems were installed in Malimono, Placer, Del Carmen, Alegria and San Benito. To sustain all these efforts, several trainings on vegetable and organic production were conducted and attended by a total of 300 farmers. A School on the Air Program for Hybrid Rice Production Program was also undertaken. The conduct of Nine (9) Farmers Field School in Malimono, Bacuag, Tubod, Mainit, Alegria and Socorro are on-going. We have also conducted the Provincial Farmers Forum with Department of Agriculture Secretary, the Honorable Proceso J. Alcala, as our guest of honor. A Farmers and Fisher folks Congress was likewise held in Siargao Island with Department of Interior and Local Government Secretary, Hon. Jessie Robredo as our guest of honor. To expand the aquaculture development projects, we have validated sites for the culture of lobster, grouper, abalone, siganid and crabs in Pilar, Del Carmen, Socorro, San Benito and Burgos. Trainings on Fish Processing and by-product utilization were conducted to 180 rural women and youth in six (6) batches. On program coordination with the Department of Agriculture, we are happy to report that we are recipient of the Mindanao Rural Development Program (MRDP) and the Caraga Integrated Development Project (CIDP). Under the MRDP, the following projects were approved for implementation: livelihood component in the municipality of Malimono and rural infrastructure component in the form of farm to market roads for 9 municipalities with a total budget allocation of P157,389,000.00 and a total provincial counterpart of P2,895,000.00. The Provincial Government through the Provincial Manpower and Training Center (PMTC) has provided free technical-vocational skills trainings particularly to the out-of-school-youths. A total of 345 skilled trainees graduated from the skills trainings conducted at PMTC. The Special Program for Employment of Students (SPES) and the Government Internship Program (GIP) helped many students in their school fees in way of compensation of their work. For this year, the PMTC in partnership with DOLE has employed 80 students under the SPES and 65 out-of-school youths and unemployed adults under the Government Internship Program. Social protection likewise takes the center stage in this administration as a measure towards eradicating poverty. We launched the Convergence Program on Social Protection Services. The convergence is aimed to raise the poor people’s share in the resources and access to public service. About 70 most depressed barangays were the focus targets and eight (8) national agencies (DSWD, DA, DOLE, DILG, DepEd, DENR, TESDA and DOH) have signed as partners. 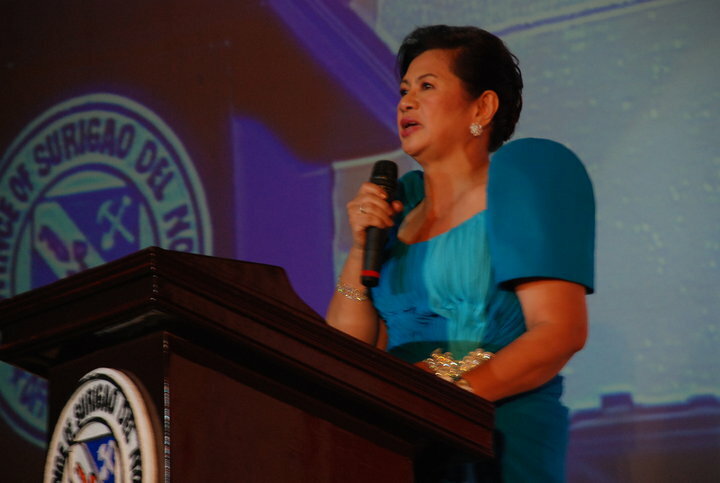 We had as our guest during the event, the Department of Social Welfare and Development Secretary Dinky Soliman. On relief operations intervention, food assistance was given to 27,550 families with a total of 128,689 persons affected by the heavy rain, floods and landslide from January to February 2011. The province was able to raise the amount of P3,490,00.00 cash donations as well as donations in kind, from various benefactors who heeded our call to help our fellow Surigaonons who were greatly affected by the calamities. Let me acknowledge and express my heartfelt gratitude to the following mining companies who manifested the spirit of volunteerism and patriotism during those times of dire need. • Platinum Group Metals Corp. In totality, about P5,099,107.65 was released to help those heavily affected, coming from the Municipal and Provincial Government, DSWD, Channel 5 (GMA), private individuals and the assistance from the mining companies. We have also been helping the poor senior citizens through the provision of P500 monthly stipend intended as additional government assistance especially for food and medicine. The Memorandum of Agreement was already signed between and among the Provincial Government, Municipal Mayors, DSWD Regional Director, and DSWD Secretary for its effect. Programs to encourage persons with disabilities to engage in livelihood programs were likewise facilitated. 7. Maintenance of Libas - Tagana-an - Himamaug - Cabongbongan Road. We were able to maintain some 192 kilometers of provincial road, representing 60% of the total provincial road. The face lifting of the Provincial Capitol will continue until all departments will be in place. This administration is fortunate to have the most active and hardworking members of the Sangguniang Panlalawigan. For the period from July 2010 to June 2011, the Sangguniang Panlalawigan were able to pass important legislation, a total of eight (8) Provincial Ordinances, of which 6 ordinances are for the conversion of roads, another ordinance creating the Provincial Internal Audit Office (PIAO), and an ordinance which authorizes both the governor and the vice governor to use savings for augmentation. A total of 216 resolutions were passed. The SP had conducted 86 committee meetings, 43 regular sessions and 3 special sessions. Only in this present administration that the Sangguniang Panlalawigan conducted out of town sessions which were held in the municipalities of Dapa, Socorro, Tubod and Alegria. In a span of one year we have gone a long way because of our persistence, patience and diligence. We have to plan fast, decide fast and implement fast. We have made progress in restoring the faith of the people in the government and introducing innovations to create a difference in local governance. I have promised to myself to strive for excellence. This administration will not tolerate corruption, mediocrity and complacency. I will focus to put the house of government in order to create a better climate for teamwork and cooperation. To answer our needs for faster and more reliable delivery of services to the Surigaonons, we will have a fully operational Management Information System Center by the end of the year. Aside from the 32 Closed-Circuit Television Cameras or CCTVs that are now in place, we will also implement the Human Resource Management and Payroll System using Biometrics for all provincial offices before 2011 ends. With the assistance from PRMF, we plan to develop a centralized computer system which would strengthen transparency and efficiency in the government. The establishment and development of a Geographic Information System(GIS) and Global Positioning System(GPS) that is fully integrated into existing Management Information Systems for our road networks are also in forward motion. We will maintain our program of bringing government closer to the people through barangay visits and consultations. The Barangay Development Academy will be launched to assist barangays in planning and management. We will have a strong advocacy on people’s participation in development. Public and private partnership will be strengthened through programs that will accord collaboration. On Health, we will expand the Panambay Sa Barangay, using the sectoral approach, with the women, senior citizens, persons with disabilities and the youth, as among our target clients. We will give emphasis on preventive health services, health and wellness programs, the integration of nutrition programs in schools curricula and the mobilization of Barangay Health Workers in barangay feeding programs. A major breakthrough in our effort to provide access to basic health services would be the opening of a modern, state of the art, 50-bed capacity Provincial Hospital in Sta. Cruz, Placer. The strategic location of the new hospital will cater to the health needs of the mainland municipalities of the province. This is a public-private partnership project, already with a committed initial budget of P50M. To intensify our efforts in providing quality basic education for our youth, we will ensure a sustained zero drop-out campaign. We will create more teacher items to respond to the huge demand and explore the possibility of increasing salaries of Local School Board teachers from P6,000.00 to P8,000.00. We will declare the province as a reading province, continue the retooling of teachers on teaching strategies and other capability building trainings, intensify Project BEST, address classroom gaps such as repairs of dilapidated schools, provision of school facilities and materials. We will establish day care centers in all barangays, with a financial assistance of P400,000.00 each, to be implemented by the local government unit using the same prototype. We have launched this program in our recent visit in Brgy. Tapian in the municipality of Mainit, with DSWD Sec. 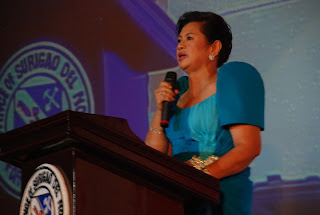 Dinky Soliman as our guest of honor. The Educational Roadmap will be in full swing as we attain to achieve our goals of 100% participation rate, 90% achievement rate and 0% dropout rate in our public schools. On environment management, we will champion Ecological Solid Waste Management in the municipalities with the help of the private sector through programs such as Siargao Green. We will strictly implement the Solid Waste Management Act of 2000. A Material Resource Recovery Facility will be established in all municipalities to support the “Kalimpyo, Kahapsay Surigao”. In the drawing board is the proposed Integrated Sanitary Landfill Project for Siargao Island which will be located in the Municipality of Del Carmen. Our war against poverty will go hand in hand with our efforts to conserve, manage, develop and properly use our natural resources. We will continuously advocate for a community-based coastal resource management and watershed management to involve the stakeholders in safeguarding the integrity of the environment. We will be closely monitoring illegal fishing activities in coordination with the PNP Maritime. We will also support the National Greening Program of President Noynoy Aquino and work together with the municipalities in the establishment of tree parks, mini-forest parks, and the likes. Strengthening of our agriculture satellite offices will be given focus as a center for agricultural trainings and seminars to farmers and fisherfolks and serve as the center in the production and dispersal of fruit trees, show window for technology transfer of greenhouse farming, organic fertilizer production, organic agriculture, production of high value crops and artificial breeding for swine. Pilot projects in aquaculture, seaweed farming and fish cage technology, among others, will be implemented to strengthen our aquaculture base. The funds for “Panginabuhi Sa Barangay” will be given to fisher folk organizations to provide alternative livelihood and, at the same time, avert illegal fishing activities in coastal areas in the province. Our major project under livelihood is the establishment of the Provincial Training and Livelihood Center in Bad-as, Placer. This community college will offer employable vocational and technical courses to serve our developing mining and other industries. This is another model of a public private partnership since the mining companies have already pledged to support this project in the amount of P40M. Tourism Assistance Centers will be established in strategic tourism destinations. Tourism marketing and promotion will be intensified, new products and new markets will be identified. We will launch the “Surigao del Norte Parade of Festivals” and declare the province as a festival province to increase appreciation for local culture and heritage. We will launch a new branding for Siargao Island that will make it a sports and adventure destination. Signages will be installed in historical and cultural landmarks. We will lobby for the fast implementation of the Tourism Nautical Highway connecting the mainland to Siargao Island via Bucas Grande Island. Programs that would create employment and economic opportunities will be given priority. We will support cooperatives, promote community-based enterprises, micro-financing scheme, youth entrepreneurship and initiate market encounters, among others. The women sector will also have its share of opportunities with the establishment of a Women’s Training Center per municipality. I have allocated the amount of P1M per municipality for this center which will also be implemented by the local government unit. The Women’s Training Center in General Luna and Dapa will be completed by December of this year. Our fight against lawlessness and criminality will continue. Our campaign against illegal mining, fishing and logging activities will be sustained. We will work hard to make this province environment and investment-friendly. The ultimate goal of all our development efforts is to improve the quality of life of the people – the Surigaonon. Ang Bag-ong Surigao will rise from the struggles and animosities of the past, like the mythical Pygmalion rising from the desert sands. But the realization of this dream is a work of a lifetime. We need the best in us to pass a better world to the next generations. Tough choices will be made for the benefits of the many. We have to make a lot of sacrifices without which we can only falter. At this point, I would like to give honors to this kid from the local barangay school who is a winner in the national search for gifted children “Ang Makabagong Rizal”. This pupil, Ernn Andre Bullo Torregoza, a sixth grader from Bonifacio Elementary School in Surigao City, symbolizes the young generation Surigaonon who are more competitive and aggressive, and who will continue to shine and inspire us. The Surigaonon – given the right opportunity – will excel in all fields of endeavor, despite of poverty and other problems. For them, we will build and shape a better world. Today I am setting out again to achieve the dream. I am making this urgent call for unity, teamwork and cooperation for us to achieve our vision. Our people can wait no longer. We must act NOW.